Bithi started work in a Bangladeshi clothing factory when she was 12. Abject poverty and a sick father forced Bithi’s family to send the two oldest daughters to the garment factories to sew designer clothes sold mainly in North America. It was either that, or watch the girls slowly starve. Now 15, Bithi helps create a minimum of 480 pair of designer jeans every day, sewing 60 pockets an hour. For this, she earns about $1 US a day. If that shocks you, makes you angry, or even makes you cry, that is an appropriate response. But at last there is a glimmer of hope for girls like Bithi. Globally, about a billion people live in such poverty that they are classed as “hungry”. Every year an estimated 3-6 million people are trafficked out of their country and into economic slavery, which may involve forced labour, prostitution, or fighting in armed conflicts. Close to 30 million people around the world are living in slavery. About three quarters of these are women or girls. Unicef estimates that 170 million children are caught up in forced labour, many making textiles and garments. Two of the industries where these problems are rife are cocoa harvesting to make chocolate, and the textile and garments trade. In recent years, increased publicity, consumer demand, protests by humans rights organisations and choices by concerned consumers have begun to make a difference. Most of the major chocolate manufacturers used to buy cocoa without necessarily having any idea of labour practices on the cocoa plantations, mostly in West Africa. But with the rise of certification schemes such as Fair Trade, and increased awareness by consumers, this has begun to change. Initially, the only way to buy ethically-sourced chocolate was to find a small niche brand that had Fair Trade certification. They weren’t always easy to find, their range was generally limited, and the costs were generally higher. Only the really committed tended to purchase from these sources. But now several of the larger companies have started to gain Fair Trade, UTZ or Rainforest Alliance certification for at least some of their range, and you can buy ethically-sourced chocolate in your local supermarket. And most of them have committed to being fully ethically-sourced as soon as these sources can meet the demand – which may be 5 or more years away, but still within sight. As a result, fewer children will work on plantations, and then only in an appropriate way, and education will be made available. Farmers will receive a better and fairer price provided they meet certain requirements that support human rights and environmental responsibility. These certification schemes and voluntary agreements are by no means perfect, but they are a big step forward for many poor farmers and their families. The world clothing industry is worth almost $2 trillion annually, but only a small percentage of this goes to those who labour, often in unsafe or unfair conditions, to produce the textiles and garments. A number of smaller ethical clothing companies have been established with Fair Trade or similar certification. As for chocolate, they can be hard to find, the range is limited and the costs may be higher, but they are a start. But pressure is growing on the major brands too. Activist or human rights organisations have investigated supply chains and quizzed manufacturers, and produced ethical clothing guides that show consumers which companies have a better human rights record. 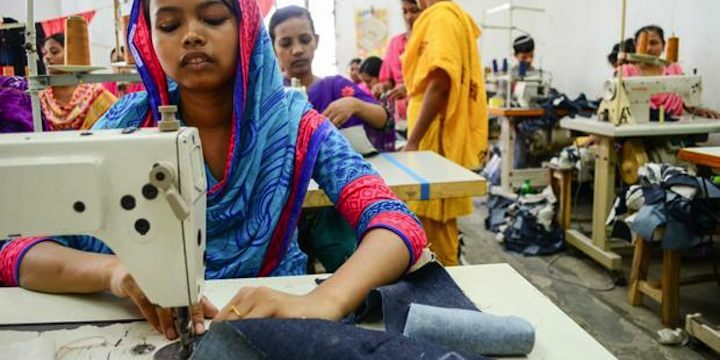 Clothing companies are starting to take notice by clarifying their own supply chains (and getting a few surprises) and making commitments to improve labour practices. Positive change is happening, and girls like Bithi might start earn a more reasonable wage. We can at least hope. At present, you’ll likely pay a little more, if you buy ethically-sourced products. But if we would be unwilling to actually whip the slave, can we justify paying the company that allows the slavery to occur? I have recently updated the Change section of this website, including the pages on ethical chocolate and ethical clothing. I was encouraged to find that many companies and made positive steps towards ethical supply chains since I first researched and wrote these pages 3 years ago. So please get the facts, including information and links on where to get ethically-sourced chocolate and clothing. And please join me and many, many others in starting to make a difference by not being complicit in the oppression of poor and vulnerable people. Thanks. Photo: © World Vision Australia 2015. All rights reserved. Used by permission. The fashion industry is playing a substantial role in reshaping nations and helping communities lift themselves out of poverty. .... At the same time however, we know that wherever measures haven’t been sufficient to uphold the rights of workers, the industry has also helped to fuel forced labour, child labour, unsafe working conditions and exploitation. The Truth Behind the Barcode. The 2016 Australian Fashion Report. Baptist World Aid.